You can view all the information, or properties, associated with an entity, but you can only edit selected properties. This is because many of the properties associated with an entity are set when it is created. The editable properties associated with an entity vary depending on the type of entity you are working with. Make sure that you have the System Administrator or System Customiser security role or equivalent permissions. Under Components, expand Entities, and then click or tap the entity you want to view or edit information for. Note (includes attachments) Select this to create a relationship with the Note entity, and add a note control to the entity form. This allows users to make annotations for each record. Activities Select this to create a relationship with the activity entities, and add an associated view to the entity. This allows you to track activities such as phone calls, e-mails, and tasks. Connections Select this to permit ad hoc connections between a record in this entity and records in other entities. Sending e-mail (if an e-mail field does not exist, one will be created) Select to add the Send Direct E-mail button to the main ribbon tab for the entity. Mail merge Select this to allow this entity to be used in a mail merge. Document management This allows you to track documents on SharePoint that are associated with a record in Microsoft Dynamics CRM. Queues Select this to use this entity in queues. Duplicate detection Select this to detect duplicates for this entity. This feature notifies you of identical records in Microsoft Dynamics CRM, and allows you to resolve them. Auditing Select this to track changes made to your business data. CRM for phones Select this to display and use this entity in Microsoft Dynamics CRM for phones. Reading pane in Dynamics CRM for Outlook Select this to display records in the reading pane in Microsoft Dynamics CRM for Microsoft Office Outlook. Offline capability for Dynamics CRM for Outlook Select this to let users create, read, update, or delete records while offline. Primary Field. On this tab, the only editable property is Description. To publish customisations for only the component that you are currently editing, on the nav bar or in the Navigation Pane, click or tap the entity you have been working on, and then click or tap Publish. To publish customisations for all unpublished components at one time, in the Navigation Pane, click or tap Entities, and then on the Actions toolbar, click or tap Publish All Customisations. Any time you change user interface elements or implement form scripts for an entity, you must publish changes to apply them. Any customizations that change the data schema of Microsoft Dynamics CRM such as custom entities, relationships, or fields are applied immediately. You can create new entities for your Microsoft Dynamics CRM implementation to address specific business requirements. After you create a custom entity, additional tasks are required to ensure that the entity is accessible to your users. By default, when an entity is created, only the System Administrator and System Customiser security roles have any privileges to read or change data in the custom entity. You must add privileges explicitly to all security roles that need to use the new entity. Choose Entities, and then on the command bar, choose New. Specify the Display Name and Plural Name that will be used for this entity throughout Microsoft Dynamics CRM. In the Name box, view the name that Microsoft Dynamics CRM will use for this entity. The Primary Image list only has the option [None] when you create a custom entity. After you create the entity you can create a new image field. Each entity can have only one image field. After you create a new image field, that field will be available for selection. After you change this setting you must save the entity and publish the customisations. Organisation. Records for this entity are used for reference by all Microsoft Dynamics CRM users. Individual users or teams can’t own these records. For example, product records are set to Organisation. Under Areas that display this entity, select the areas where this entity will be displayed in the Microsoft Dynamics CRM user interface. Business process flows (fields will be created) Select this to enable creating business process flows for this entity. Activities Select this to create a relationship with the activity entities, and add an associated view to the entity. This allows you to track activities such as phone calls, emails, and tasks. Connections Select this to permit connections between a record in this entity and records in other entities. Sending email (if an email field does not exist, one will be created) Select to add the Send Direct Email button to the main ribbon tab for the entity. Document management Select this to track documents on SharePoint that are associated with a record in Microsoft Dynamics CRM. Access Teams Select this to enable this entity for access teams. Allow quick create When this is enabled, and after you have created and published a Quick Create Form for this entity, people will have the option to create a new record using the Create button in the navigation pane. CRM for tablets When this is enabled this entity will be available using Microsoft Dynamics CRM for tablets. You also have the option to make this entity Read-only in CRM for tablets.If the forms for an entity require an extension that is not supported by CRM for tablets, such as I-frame or web resource controls, use this setting to ensure that the data for these entities is not editable by people using CRM for tablets. Offline capability for Dynamics CRM for Outlook Select this to let users choose to include records for this entity with those they can work with while offline. To ensure that an easily recognisable name is used to reference this entity, on the Primary Field tab, enter a descriptive Display Name, and then verify that Requirement Level set to Business Required. The primary field is displayed when relationships to this entity are created or displayed, such as in the Look Up Records dialogue box. The default Display Name for the primary field is Name. The Name will be “new_name” if you use the default publisher customisation prefix of “new”. If this is not the name you want to use, you must set the name when you create the entity. You can edit the display name after you save the entity. The primary attribute you defined and the standard attributes. To see a list of them, navigate to the new entity you created, and under it, choose Fields. They are displayed in the main pane. For entities that have Ownership set to User or Team, the creation of the Owner and Owning Business Unit attributes. For entities that have Ownership set to Organisation, the creation of the Organisation ID attribute. A filtered view is created in the CRM Online database for the entity. This filtered view can be used to write reports using data from this entity. c. Open a security role, and then on the Custom Entities tab, specify the level of privileges that you want users with that security role to have. d. Choose Save and Close to save the changes to the security role. To publish customizations for only the component that you’re currently editing, choose the entity you’ve been working on, and then choose Publish. To publish customizations for all unpublished components at one time, choose Entities, and then on the command bar, choose Publish All Customizations. Any time you change user interface elements or implement form scripts for an entity, you must publish changes to apply them. Any customisations that change the data schema of Microsoft Dynamics CRM such as custom entities, relationships, or fields are applied immediately. Create new fields to capture data when existing system entities don’t have fields that meet your requirements. Some system entities or custom entities that are included in a managed solution may not allow you to add new fields. Some system fields or custom fields that are included in a managed solution may not allow you to edit them. The default solution is a special unmanaged solution which shows you all solution components from any managed or unmanaged solutions. You can’t edit ANYTHING in the context of a managed solution. But all the things you find there are in your default solution anyway, so you don’t need to. For more information, see TechNet: Create and edit fields. Remember to add a description of the field – this provides instructions to your users on how to use the new field. Under Components, expand Entities, and then expand the entity you want. To add a new field, on the Actions toolbar, choose New, and enter a Display Name to generate the Name. i. For Field Requirement, select whether it’s optional, recommended, or required. ii. In Searchable, select whether to include this field in the list of fields shown in Advanced Find for this entity and also in the field available for customizing the find columns in the Quick Find iii. view and the Lookup view. iv. For Auditing, enable or disable the feature for this field. Ticker Symbol. This creates a stock ticker symbol in all capital letters. Click the symbol to open information about the stock in the user’s default browser. By default, the MSN website opens. Phone. This creates a link that enables Skype or Microsoft Lync users to initiate a call by using the linked number. Lync has been rebranded as Skype for Business. Currently, you’ll still see references to “Lync” in Microsoft Dynamics CRM, but CRM will work with Skype for Business. Option Set Select an existing option set, or define a new one. Two Options After creating this field, configure it in the form to which it was added. In the form, select whether the field is displayed as option buttons (also known as radio buttons), a check box, or a list. Image Each entity can have one image field. When an entity has an image field it can be configured to display the image for the record in the application. None. The defaults are integer values between -2,147,483,648 and 2,147,483,648, although you can set different minimum and maximum values. Duration. This creates a drop-down list box with values in minutes, hours, and days. Time Zone. This creates a drop-down list box with options for every available time zone. Language. This creates a drop-down list box with options for every language that your organization has made available for users. Floating Point Number Select up to 5 precision points. You can set the minimum and maximum values. Decimal Number Select up to 10 decimal points. You can set the minimum and maximum values. Currency. A lookup data type whose value must be set before you can set the value of a field with a currency data type. Exchange Rate. This has a decimal number data type. Multiple Lines of Text This is a scrolling text box. You can set the maximum number of characters for this field. Lookup You can create a lookup field using an entity relationship that has already been created, but not yet used with another lookup field. If you create a lookup field in an entity form, the relationship is automatically generated. A lookup field is created as a relationship field. Select the Field type, Format, and Maximum length of the field. Select the IME mode for this attribute. This specifies whether the active state of an Input Method Editor (IME) is enabled. An IME lets you enter and edit Chinese, Japanese, and Korean characters. IMEs can be in an active or inactive state. The active state accepts Chinese, Japanese, or Korean characters. The inactive state behaves like a regular keyboard and uses a limited set of characters. Choose Save and Close to close the form editor. To publish customizations for just one entity, under Components, choose Entities. Then, on the Actions toolbar, choose Publish. To publish all customisations you have made to any entities or components, on the Actions toolbar, choose Publish All Customisations. Installing a solution or publishing customizations can interfere with normal system operation. We recommend that you schedule a solution publish when it’s least disruptive to users. Mapping streamlines data entry when you create new records that are associated with another record. When two entities have an entity relationship, it is possible to create new related entity records from the associated view that is visible on the primary entity. When the user creates a new record from an associated view, mapped data from the primary entity record is copied to the form for the new related entity record. You control what data is copied by adding new mappings in the relationship between the two entities. If a record is created any way other than from the associated view of the primary entity, data is not mapped. Mapping only applies just before a new record is created from an associated view. Users are able to make changes before saving the record. Later changes to the data in the primary record are not applied to the related record. It is possible to automatically create mappings for the relationship but this usually is not recommended. This process will map any mappable fields based only on the data type and name of the field. All existing mappings are removed. Entity relationships define how records can be related to each other in a database. N:1 (Many-to-one) relationships exist between entities and refer to each entity as either a Primary Entity or Related Entity. The related entity, sometimes called the child entity, has a lookup field that allows storing a reference to a record from the primary entity, sometimes called the parent entity. An N:1 relationship is just a 1:N relationship viewed from the related entity. Entity relationships define how records can be related to each other in a database. A 1:N (One-to-Many) relationship is when one entity record for the Primary Entity can be associated to many other Related Entity records because of a lookup field on the related entity. When viewing a primary entity record you can see a list of the related entity records that are associated with it. In the default solution or an unmanaged solution you can create new forms or edit existing forms for all entities that allow form customisation. In an unmanaged solution, you can edit the managed properties for an unmanaged custom entity that was created for the solution. If you’re viewing a managed solution, you can’t create new forms or edit existing forms for entities. However, if the managed properties for an entity in the managed solution are set to allow customisation, you can add or edit forms to that entity in the Customisation area of Microsoft Dynamics CRM. Customisation tasks can be performed only while you’re online. Under Components, choose Entities, and then expand the required entity. Choose Forms, and then select the form. On the command bar, choose Managed Properties. In the Set Managed Properties dialog box, if Customizable is set to True, you can add or edit forms. You can also navigate to the form editor from a list in the Sales, Marketing, or Service areas. For example, to edit an account form, go to Accounts, choose the More ( ) button, and then choose Customize Entity. When you create a new form for an entity, its form type is Main. When the new form opens, it is identical to the form named Information. You can add or edit fields, sections, tabs, and navigation, and properties associated with the form, and then save the form. This procedure applies to any form with a form type of Main. Each main form is comprised of one or more tabs. Each tab can have one or more sections. Each section contains one or more fields or IFRAMES. If you want to base your new form on an existing form, you can clone a form. Under Components, expand Entities, expand the entity you want to modify the main form for, and then choose Forms. To create a new form, on the command bar, choose New. To edit an existing form, double-click or tap any form with a form type of Main. For more information, see TechNet: Customise your CRM system. For more information, see the TechNet: Customise your CRM system. Add event scripts, as needed. a. On the Home tab, choose Preview, and then select Create Form, Update Form, or Read-Only Form. b. To close the Preview form, on the File menu, choose Close. When you finish editing the form, choose Save As, enter a name for the form, and then choose OK.
To publish customisations for only the component that you are currently editing, under Components, choose the entity you have been working on, and then choose Publish. To publish customisations for all unpublished components at one time, under Components, choose Entities, and then on the command bar, choose Publish All Customisations. You cannot apply a requirement level to a field using this form. Requirement level constraints are applied to the attribute. Before deleting a field from a form, make sure the field is not required by other components or custom scripts. For example, the Opportunity form requires the Price List field to determine the pricing to use when adding a product to that opportunity. Removing the Price List field would prevent adding a new product to an opportunity. Any time you change user interface elements or implement form scripts for an entity, you must publish changes to apply them. Any customizations that change the data schema of Microsoft Dynamics CRM, such as custom entities, relationships, or fields, are applied immediately. You cannot use the form editor to modify the visual style of forms, such as the font style, font size, or colors used in the form. Modification of the Cascading Style Sheets (CSS) pages in the web application or style properties of the form through scripts is not supported. 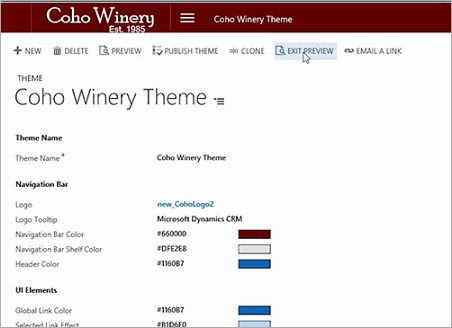 Personalise your Microsoft Dynamics CRM applications and create a uniform look and feel that matches your organisation’s brand by creating a custom theme. For example, without writing any code, you can add a company logo or change default colors for the CRM masthead, menus, entities, or links. Preview your custom theme, and then publish it for the whole team when you’re ready. Want to see themes in action? Watch this short video (2:45). To see video captions, choose the Closed Caption (CC) button in the lower-right corner of the YouTube window. Have you ever wanted to add your logo or change the colours of the CRM interface to better fit your brand? Many companies use Microsoft Dynamics CRM in conjunction with other systems and want a uniform look and feel across all other business applications. Using the new theming feature, you can now style CRM for a more customised user interface that better suits your branding goals. To get started with theming, navigate to the Customisation area under Settings. You’ll find Themes as an option there. You’ll see that the default colour is the CRM blue theme. To start setting up a customised theme, you can clone an existing theme or create one from scratch. From the Theming record you can upload logos and set colours for many different areas. We primarily allow customisations for accent colours in CRM. Some examples of accent colours are links, hover effects, and selected effects. Other items such as backgrounds, fonts, and icons can’t be changed at this time. Also note that legacy areas in the CRM application do not fully support theming. A logo can also be set from the Theming record by selecting an existing web resource or uploading a logo from your local computer. As you work on your custom theme, you may also want to take a look at the work in progress. To do that without affecting users, choose Preview Theme. This will refresh the page and reload your CRM system with the current theme and it will only apply to you. While previewing, you may realize some additional work needs to be done. If so, choose Exit Preview to revert to the original theme. Otherwise, we can publish the theme and push it out to all users. Themes aren’t solution aware, so to move themes across systems, a theme record needs to be exported, re-imported into the target system, and then published. In addition to theming, customizers can now adjust entity colours. To do that, navigate to the Customize the System dialogue box. From there, you’ll see a new field per entity, allowing you to set the colour. This entity colour will be applied to areas such as the navigation bar. We hope you like the new theming feature and look forward to seeing some creative and colourful CRM instances! If a Microsoft Dynamics CRM form doesn’t meet your organisation’s business requirements, you can customize the form by changing existing fields or by adding new fields. While it might be simpler to edit the existing fields on a form, sometimes it’s better to add a field to address a specific business scenario. Under Components, expand Entities, expand the entity you want to customize, and then choose Forms. In the list, locate an entry with the form type of Main, and then double-click or tap to edit it. In the form, choose the section you want to add a field to, and then in the Field Explorer pane, double-click the field you want added to the form. b. To close the preview form, choose Close . c. To publish customisations for the form that you’re editing, with the form open, choose Publish. When you’re finished editing the form, choose Save and Close. 9. To publish customisations for all unpublished components at one time, choose File, and then choose Publish All Customisations. Publishing customisations can interfere with normal system operation. We recommend that you publish when it’s least disruptive to users. Under Components, expand Entities, expand the entity you want to work with, and then choose Forms. On the form body, double-click or tap the field you want to edit. Change or hide the label used for this field in this form. The field display name remains unchanged. Specify whether the field is read-only by selecting or clearing the Field is read-only check box. In the Locking section, specify whether to lock the field to the form and prevent anyone from removing it by selecting or clearing the Lock the field on the form check box. Specify whether a field is visible in the default view by selecting or clearing the Visible by default check box. If the check box is cleared, the field will not display in the Reading Pane in Microsoft Dynamics CRM for Microsoft Office Outlook. However, the field will display in the Microsoft Dynamics CRM web application unless you use JScript to define other behavior. In the web application, JScript overrides the value set by this check box. In the Related Records Filtering section, to filter the list of displayed records in the lookup, select the Only show records where check box. The relationship combinations that are possible when you filter related records are listed in the following table. First list relationship Second list relationship Available? The first list is populated with all the potential relationships you can use to filter this lookup. Click one. The second list is then populated with all relationships that connect the related entity (selected in first list) to the target entity. Click one. Select the Allow users to turn off filter check box to give users the option of turning off the filter you define here. This makes it possible for them to view a wider range of records. If you want to make sure that users only see the limited range of records defined by this filter, clear this check box. Also, for lookup fields, the tab displays the Additional Properties section. Here, select the Display Search box in lookup dialogue check box if you want a search box to be available in the lookup. In the Default View list, click the default view for which results will be displayed in the lookup. If you want users to also have the option of selecting other views, select the Enable the View selection in lookup dialogue check box. Formatting. The formatting options displayed vary based on the which options are set for the section of the form that the field appears within. Details. This tab provides access to the basic properties associated with the field. Choose Edit to modify them. Form Libraries. In this section, you can add or remove the available JScript libraries for form or field events. You can edit the listed custom libraries if necessary. Event Handlers. In this section, you can add a JScript library (a script web resource) authored by a developer and associate a function within that library to an event. In the Events list, choose onChange, and then choose Add. In the Handler Properties dialogue box, supply the requested information. Select the Enabled check box to make the function available to be called by a field event. Business Rules. Use this tab to create or edit the process components of business rules. When you finish modifying the properties for the field, in the Field Properties dialogue box, choose OK. When you finish editing the form, on the Home tab, choose Save and Close to close the form. To publish customisations for only the component that you are currently editing, on the nav bar or in the Navigation Pane, choose the entity you have been working on, and then choose Publish. To publish customisations for all unpublished components at one time, in the Navigation Pane, choose Entities, and then on the Actions toolbar, choose Publish All Customisations. Installing a solution or publishing customisations can interfere with normal system operation. We recommend that you schedule a solution import when it’s least disruptive to users. In the form Navigation Pane, you can add links to related entities. When a user clicks one of these links in a record, the associated view for the entity is displayed. To add a link to a related entity, on Home tab, in the Select group, choose Navigation. The Relationship Explorer pane displays on the right side of the form editor. Available Relationships. Lists all the entities that can be related to the entity the form is associated with. 1:N Relationships. Lists entities that can be related in a 1:N relationship to the entity the form is associated with. N:N Relationships. Lists entities that can be related in a N:N relationship to the entity the form is associated with. If no related entities show up in the Relationship Explorer pane, you cannot create a link on this form to a related entity. Select the related entity you want to link to, drag it to the Navigation Pane, and then drop it where you want it to be displayed. To edit the properties for this or any other related entity link, in the Navigation Pane, select the link, and then on the Home tab, choose Change Properties. In the Relationship Properties dialog box, on the Display tab, type a new display label. On the Name tab, choose Edit to view or edit the details associated with the relationship record. When you finish editing the form, choose Save and Close to close the form. To publish customisations for only the component that you are currently editing, in the Navigation Pane, choose the entity you have been working on, and then choose Publish. To publish customisations for all unpublished components at one time, in the Navigation Pane, choose Entities, and then on the command bar, choose Publish All Customisations. You can add or edit web resources on a form to make it more appealing or useful to users. The types of web resources that you can add or edit on a form are images, HTML files, or Silverlight controls. Under Components, expand Entities, and then expand the entity you want to work with. Choose Forms, in the list locate a form of type Main, and then double-click or tap the entry to open and edit the form. To add an existing web resource, choose the tab (for example, General or Notes) you would like to insert it on, and then on the Insert tab, choose Web Resource. To edit a Web resource, select a form tab and the web resource that you want to edit, and then on the Home tab, choose Change Properties. In the Add Web Resource or Web Resource Properties dialogue box, on the General tab, enter the appropriate information in the required fields. a. In the Web resource box, select the image, HTML, or Silverlight web resource that you want to use. After you specify a web resource, the Web Resource Properties section appears at the bottom of this tab, providing options that vary based on the type of web resource you are adding. These options include specifying custom parameters, passing a record object-type code as a parameter, or specifying alternative text that describes the resource or, for images, that makes the image more accessible to all users. b. In the Name box, enter a unique name for the field. The name can contain only alphanumeric characters and underscores. c. The Label field is automatically populated with a variation of the name you specify, but ensure that the proposed label meets your needs or update it accordingly. On the Formatting tab, the options that display vary based on the type of web resource inserted. These options include specifying the number of columns and rows display, whether a border displays, and the scrolling behaviour. If the Dependencies tab displays in the Add Web Resource or Web Resource Properties dialogue box, from the Available fields list, select the fields that are required by the Web resource, choose the Add Selected Records button to move the selected fields to the Dependent fields list, and then choose OK to close the dialogue box. In the default solution or an unmanaged solution, you can create new public views or edit existing views of all types for entities that allow view customization. In a managed solution, you can’t create new views or edit existing views for entities. However, if the managed properties for an entity in the managed solution are set to allow customization, you can create new public views or edit existing views of all types in the Customisation area of Microsoft Dynamics CRM. Choose Views, and then select the view. On the Actions toolbar, choose More Actions, and then select Managed Properties. You can edit the view if the entity is unmanaged. In the Set Managed Properties dialogue box, set Customisable to allow editing or creating views. If you edit a public view, the changes are visible to everyone who has permission to view records for the entity. Besides public views, the following views are provided for all entities and can’t be deleted or shared: Quick Find Views, Advanced Find Views, associated views, and lookup views. To create a new public view, on the Actions toolbar, choose New. On the View Properties dialogue box, in the Name box, type a name for the new view, and then choose OK. If the New button does not appear, you can’t add views for the entity you selected. To edit a view, double-choose a Public View in the list. The view type is specified in the Type column. Modify the columns that are displayed. a. In the Common Tasks area, for Quick Find Views, choose Add View Columns, or for other types of views, choose Add Columns. For other types of views, choose Add Columns. b. Select the check boxes for the columns you want to add, and then choose OK.
a. Choose the column you want to move. b. In the Common Tasks area, use the arrows to move the column left or right. a. Choose the column you want to change. b. In the Common Tasks area, choose Change Properties. c. In the Change Column Properties dialog box, choose an option to set the column width, and then choose OK.
a. Choose the column you want to remove. b. In the Common Tasks area, choose Remove. c. In the confirmation message, choose OK.
a. In the Common Tasks area, choose Configure Sorting. b. In the Configure Sort Order dialogue box, in the Column list, select the column you want to sort, then choose Ascending Order or Descending Order, and then choose OK.
a. In the View form for the selected entity, choose the column you want to change. c. In the Change Column Properties dialogue box, select the Enable presence for this column, and then choose OK.
Set any public view as the default view for an entity. Every entity in Microsoft Dynamics CRM must have a default public view. This is the view that is displayed for a list of entities, such as Appointment, Account, or Contact. For example, if your organisation is set up so that users manage their own appointments, you can change the default view for Appointments from All Appointments to My Appointments. a. In the list of views, select the public view that you want to set as the default. The view type is indicated in the Type column. b. On the Actions toolbar, choose More Actions, and then choose Set Default. Choose Save and Close to close the view. To publish view customisations for just one entity, under Components, choose Entities, and select the entity. Then, on the Actions toolbar, choose the Publish button. You can edit an entity’s Quick Find view (the view used to display results of searches performed using the Search box), for example to modify the fields that are searched and which columns display or to specify the width and sort order of the columns displayed. Changes to the Quick Find view associated with an entity set the default view for everyone who uses the search box for that entity. Under Components, expand Entities, expand the entity you want to modify, and then choose Views. In the list of views, in the Type column, locate Quick Find View, and then double-click or tap the view. a. In the Common Tasks pane, choose Add Find Columns. i. In the Common Tasks area, for Quick Find Views, choose Add View Columns. ii. Select the check boxes for the columns you want to add, and then choose OK.
i. Choose the column that you want to move. ii. In the Common Tasks area, use the arrows to move the column left or right. i. Choose the column that you want to change the width for. ii. In the Common Tasks area, choose Change Properties. iii. In the Change Column Properties dialogue box, choose an option to set the column width, and then choose OK.
i. Choose the column that you want to remove. ii. In the Common Tasks area, choose Remove. iii. In the confirmation message, choose OK.
i. In the Common Tasks area, choose Configure Sorting. ii. In the Configure Sort Order dialogue box, in the Column list, select the column you want to sort, choose Ascending Order or Descending Order, and then choose OK.
i. In the View form for the selected entity, choose the column you want to change. Only some columns have presence such as Primary Contact or Potential Customer. iii. In the Change Column Properties dialogue box, select the Enable Presence for this column, and then choose OK. Choose Save or Save and Close. On the command bar, choose Publish. When the customisations are published, a confirmation message appears. A customised business entity might have different properties than those described in Help; Help does not contain content that is specific to the custom entities your organisation creates. However, Help does describe how to create and use custom entities. Publishing customisations can interfere with normal system operation. We recommend publishing when it’s least disruptive to users. In Microsoft Dynamics CRM, every entity, such as Appointment, Account, or Contact, requires a default public view. However, you can change the default view for an entity to accommodate the specific needs of your business. For example, if your organization is set up so that users manage their own appointments, you can change the default view for the Appointment entity from All Appointments to My Appointments. You can make any public view the default public view for an entity. The default view for some entities isn’t configurable. Choose Views, and then in the list, select the Public View you want to set as the default for that view. On the command bar, choose More Actions, and then choose Set Default. To publish customizations for only the component that you’re currently editing, under Components, choose the entity you have been working on, and then choose Publish. To publish customizations for all unpublished components at one time, under Components, choose Entities, and then on the command bar, choose Publish All Customizations. Publishing customisations can interfere with normal system operations. We recommend you publish customisations when it’s least disruptive to your users. After you create customised entity and field text, you may want to translate it into other languages. On the Actions toolbar, click or tap Export Translations. After completing the export, open or save the compressed (.zip) file that contains the exported labels to your local computer or network. Extract the XML file from the compressed (.zip) file and translate it. If you have customised entity or field text, such as field labels or drop-down list values, you can provide the users in your organization who are not working with the base language version of your Microsoft Dynamics CRM implementation with this customised text in their own languages. To do so, you export the text strings for all your customisations so that they can be translated into the languages you use in your organisation. After the translation, you need to import the translated text strings into your Microsoft Dynamics CRM implementation before users can take advantage of the changes. The file that you import must be a compressed file that contains the CrmTranslations.xml and the [Content_Types].xml file at the root. Microsoft Dynamics CRM cannot import translated text that is over 500 characters long. If any of the items in your translation file are longer than 500 characters, the import process will fail. If the import process fails, review the line in the file that caused the failure, reduce the number of characters, and try to import again. Also note that after you import translated text, you must republish customisations. In the solution explorer, on the Actions toolbar, choose Import Translations. In the Import Translated Text dialog box, specify the file that contains the translated text, and then choose Import. When Microsoft Dynamics CRM finishes importing the translated text, choose Close. Publishing customisations can interfere with normal system operation. We recommend you schedule publishing when it’s least disruptive to users. When you create a custom entity, it is automatically assigned a default icon, and all custom entities by default use the same icon. If your organization has several custom entities, it can be helpful to change the icon associated with one or more custom entities to help users differentiate them. You cannot modify the icons assigned to system entities. 16 x 16 pixels in size. In .gif, .png, or .jpg format. No larger than 10 kilobytes. 32 x 32 pixels in size. Expand Entities if necessary, choose the custom entity you want to update the icon for, and then on the command bar, choose Update Icons. In the Select New Icons dialogue box, under Icon in Web application or Icon for Entity Forms, to the right of New Icon, choose the Browse button , select the appropriate image file, and then choose OK.
On the command bar, on the File menu, choose Save. New icons might not display in Microsoft Dynamics CRM until you close and reopen the Microsoft Dynamics CRM client. Using teams in Microsoft Dynamics CRM is optional, however, teams give you an easy way to share information and collaborate with users across business units. A team is a group of users. As a group, you will be able to track information about the records and perform assigned tasks in much more efficient and coordinated way. While a team belongs to only one business unit, it can include users from other business units. A user can be associated with more than one team. There are two types of teams that you can work with: owner and access. An owner team owns records and has security roles assigned to the team. The team’s privileges are defined by these security roles. In addition to privileges provided by the team’s security roles, users have the privileges defined by their individual security roles and by the roles from other teams in which they are members. A team has full access rights on the records that the team owns. An access team doesn’t own records and doesn’t have security roles assigned to the team. The users have privileges defined by their individual security roles and by the roles from other teams in which they are members. The records are shared with an access team and the team members are granted access rights on the records, such as Read, Write, or Append. An access team can be created manually (user-created) or automatically (system-managed). You can share multiple records with a user-created access team. A system-managed team is created for a specific record and other records can’t be shared with this team. For system-managed teams, you have to provide a team template that the system uses to create a team. In this template, you define the entity type and the access rights on the record that are granted to the team members when the team is created. A team template is displayed on all record forms for the specified entity as a list. When you add the first user to the list, the actual access team for this record is created. You can add and remove members in the team using this list. The team template applies to the records of the specified entity type and the related entities, according to the cascading rules. To give team members different access on the record, you can provide several team templates, each template specifying different access rights. For example, you can create a team template for the account entity with the Read access right, which allows the team members to view the specified account. For another team that requires more access to the same account, you can create a team template with Read, Write, Share and other access rights. Only entities that are enabled for system-managed access teams can be specified in the template. If you change access rights in the team template, the changes are only applied to new system-managed access teams. The existing teams aren’t affected. For information about how to create a team template, enable an entity for system-managed access teams and how to customize the entity form to add the team template, see Create a team template and add to an entity form. A team template can be used for the entities that are enabled for automatically created access teams. In the team template, you have to specify the entity type and the access rights on the entity record. For example, you can create a team template for an account entity and specify the Read, Write, and Share access rights on the account record that the team members are granted when the team is automatically created. After you create a team template, you have to customize the entity main form to include the new team template. After you publish customisations, the access team template is added in all record forms for the specified entity in a form of a list. For example, you created a team template called “Sales team” for the account entity. On all account record forms you’ll see the list called “Sales team”. You can add or remove team members using this list. In the Customization window, choose Customize the System. In the navigation pane, expand Entities, and then choose the entity you want to use in the team template. On the Entity Definition form, in the Communication & Collaboration section, select the Access Teams checkbox. On the Actions toolbar, choose Save. On the Actions toolbar, choose New, complete the required fields, and then choose Save. In the navigation pane, expand Entities, expand the entity you want to use in the team template, and then choose Forms. In System Forms, select Active Forms > Main form. On the Main form, open the Insert tab. On the ribbon, choose Sub-Grid. The Set Properties dialogue box appears. In Set Properties, complete the required fields, and then select the Display label on the Form check box. In the Records drop-down list, select All Record Types. In the Entity drop-down list, select Users. In the Default View drop-down list, select Associated Record Team Members. In the Team Template drop-down list, select the desired template and choose Set. The team template you selected now appears on the Main form. 13. On the Actions toolbar, click or tap Save, and then choose Publish. This page is designed for developers who want to link to the Microsoft Dynamics CRM SDK, developer tools, or want to know the service endpoint URLs. You need the unique name for your organisation when you interact with the Discovery Service. This is the public certificate that is required to configure Microsoft Azure Active Directory Access Control Service (ACS) for Microsoft Dynamics CRM integration. The Microsoft Dynamics CRM Developer Center on MSDN contains a wealth of information to help developers. Here you will find the SDK, which includes documentation, samples, and tools, as well as technical articles, ramp-up kits, videos, blogs, forums, and more. For more information about using each item on the developer resources page, see MSDN: Download the endpoints using the Microsoft Dynamics CRM Developer resources page. This is a Web service that provides information about the organisations that are available on the Microsoft Dynamics CRM server using the SOAP protocol. This information includes the URL for each organisation. This is a Web service that provides access to the business data and metadata for your organisation using the SOAP protocol. An Open Data (OData protocol) Web service that provides access to the business data for your organisation using a RESTful API. This link opens the Conceptual Schema Definition Language (CSDL) document, which describes how to access your data using this API. For some entities (record types), such as account and user, hierarchies are enabled by default. Other entities, including Case, Contact, Opportunity, Order, Quote, Campaign, and Team can be enabled for a hierarchy, and all custom entities can be enabled for a hierarchy. For more information, see TechNet: Query and visualise hierarchical data. An option set is a type of field, included in a record type (entity), that defines a set of options. When an option set is displayed in a form, it uses a drop-down list control. When displayed in Advanced Find, it uses a picklist control. Sometimes option sets are called picklists by developers. For information on creating and editing option sets, see TechNet: Create and edit global option sets. A drop-down list of views is frequently used to give people options for displaying different subsets of records. The records selected in views are displayed in a list (also called a “grid”). Views also define the data source for charts. For more information on creating views, see TechNet: Create and edit views. To create a new web resource, choose Components > Web Resources, and then on the Actions toolbar, choose New. Type or modify information in the text boxes. The name entered in the Name text box, plus the file extension will become its file name. The name entered in the Display Name text box will be displayed in the Display Name. In the Type drop-down box, select the file type you want. Choose Browse to select and upload the file from your local machine. To preview an uploaded image web resource: Choose Web Resource>Preview. To edit a text web resource: Choose Text Editor. To preview a text web resource: Choose Web Resource> Preview. When you’re ready to save your data, choose Save and Close. For only the edited component: Choose Save > Publish on the Home. For all unpublished components at one time, choose Publish All Customisations. Publishing customisations can interfere with normal system operations. We recommend you publish customisations when it’s least disruptive to users. Before you publish any customisations, you should thoroughly test your scripts. You can perform customisation tasks only while you’re online. Choose Components > Entities, and then expand the entity you want. Choose Forms. In the list, choose a form to edit if it has a form type of Main. On the Home tab, choose Preview, and then select Create Form, Update Form, or Read-Only Form. a. If you have added an OnLoad event for the form, open the form in each mode, and verify that your event executed as expected. b. If your code depends on data existing in the form when it loads, test your script in an OnChange or OnSave event to enter sample data into the form. The Update Form will open with no data. i. If you have added an OnChange event for a field, for create and update modes, enter the data in the field and verify that your event executed as expected. ii. If you have added an OnSave event for a field, for create and update modes, choose Simulate Form Save and verify that your event executed as expected.